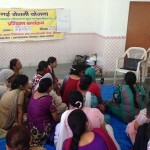 “Nai Roshni”, a Leadership Development Programme for Minority Women in district Dehradun has been conducted. As many as 1350 women in all have been trained in the past two years. In the training conducted this year, 375 more women have been trained in 15 trainings. The trained women belonged to minority communities such as the Muslims, Christians, Sikhs, Buddhists, Jain etc. from villages like Sabhawala, Hinduwala, Adhoiwala, Lakshmipur, Indripur, Martindale etc of Doiwala, Raipur, Sahaspur and Vikasnagar blocks of Dehradun districts.